My music is the space where I explore the expressive potential that lies within the intersection of sound and computational technology. Carlos Lopez Charles is a composer, electric guitar player, and digital media artist whose work covers a wide range of formats: solo instruments, instruments with live electronics, ensembles, works for orchestra, and interactive audiovisual artworks. He holds a PhD (2015), a Master's degree (2006) from the Paris 8 University (France), and a Bachelor degree (2003) from the Escuela Superior de Musica (Mexico). 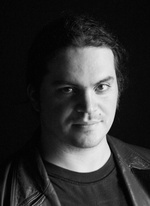 Since 2004, he has been a recipient of various grants and commissions in different countries, such as the National Arts Center Orchestra (NAC; Ottawa, Canada); the International Institute for Electroacoustic Music (IMEB; Bourges, France), the National Arts Council and the National Council for Technology and Sciences Grant (Mexico), the Excellence in Arts and Social Sciences Grant (Embassy of France in Mexico), and the Young Artists Grant (Mexico). From 2012 to 2015, he was a research fellow in the School of Music at the University of Queensland (Brisbane, Australia). His music has been performed in various international festivals and forums, such as the International Computer Music Conference (Australia and Cuba), Journées d'Informatique Musicale (France), Sociacusia Festival (Mexico), Manuel Enriquez Festival (Mexico), Visiones Sonoras Festival (Mexico), Tsonami Festival (Argentina), Acousmain Festival (Germany), Klem-Kuraia Festival (Spain), NWEAMO Festival (U.S.A.), Presencia de Musicas Actuales Festival (Chile), Tilde Festival (Australia), and Bartok Festival (Hungary). Video and audio documentation of his work are available on his personal website.